Posted by Arun Rajagopal in Conversations, Digital, Healthy Living, Oman, Social Media. I recently wrote an opinion piece for Urbane, a leading lifestyle magazine in Oman. (Jan 2008, Annual Issue). It was a column called ‘Over the table: View from this side‘ where two people discussed about the pros and cons of a particular issue. 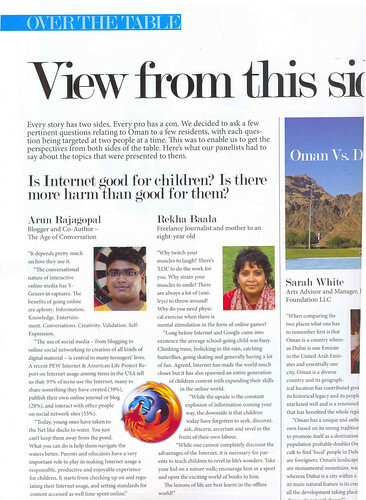 I’d to say ‘aye’ to the issue: Is the Internet good for children? & ‘nay’ to: Is there more harm than good for them? Rekha Baala, the opposing advocate, had a very useful perspective where she said: The lessons of life are best learnt in the offline world. In this blog post, I’m inviting 6 bloggers who can comment better on this issue. Amy Jussel, Tim Jackson, Drew McLellan, Greg Verdino, Robyn McMaster & Luc Debaisieux. Looking forward to hear your perspectives, as well. Here’s a more expanded version of my article for my blog readers. How good is the Net for kids? Depends pretty much on how they use it. They are on Chat, Instant Messaging, Email, MySpace, Facebook, P2P networks, YouTube, and more. The conversational nature of interactive online media has Y-Geners in raptures. The benefits of going online are aplenty: Information. Knowledge. Entertainment. Conversations. Creativity. Validation. Self-Expression. How does it feel to have the world at your fingertips? A recent PEW Internet & American Life Project Report on Internet usage among teens in the USA tell us that: 93% of teens use the Internet, many to share something they have created (39%), publish their own online journal or blog (28%), and interact with other people on social network sites (55%). How cool is that? Today, young ones have taken to the Net like ducks to water. You just can’t keep them away from the pond. What you can do is help them navigate the waters better. Parents and educators have a very important role to play in making Internet usage a responsible, productive and enjoyable experience for children. It starts from checking up on and regulating their Internet usage, and setting standards for content accessed as well time spent online. Be an online mentor to your kids, especially if they are under the age of 10. Browse websites and online resources of interest together. Have a fixed time out on the Net. Stay involved with your children’s online lives. Have standard security, content and privacy filters and controls on your computer. There are many online support resources on issues such as Parent and Teen Internet Use; Objectionable Content, Online Stranger Contact; Cyber bullying; and Online Privacy.